Summary: Tied to Deceit follows Superintendent of Police Chief Vishwanath Sharma as he investigates a massive cast of characters potentially involved with the murder of hospital secretary Devika Singh in this fascinating whodunnit mystery. 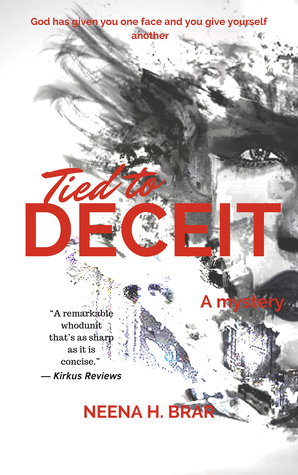 One of the things I particularly enjoyed about Tied to Deceit was the way author Neena H. Brar took her time with the mystery. She lets it unfold slowly before the readers, taking care to spend time with each member of the huge cast of characters. It allows the reader to become completely immersed in the investigation themselves. Brar does a wonderful job of revealing evidence to the reader bit by bit. She allows her readers to tray and draw their own conclusions before dropping the final bombshell on them in the last few pages. I feel like a lot of novels reveal too much too soon, and this one found the perfect balance. The murder victim, Devika Singh is a fascinatingly unlikable woman. SP Sharma is hard-pressed to find someone who doesn’t have a motive for killing her. As soon as the reader thinks they’ve figured out who the true killer is, a new, equally believable possibility is revealed. I was surprised to find myself growing more and more sympathetic towards Devika as the investigation into her murder went on. While I definitely didn’t like her as a person, I really enjoyed the way Brar made me look at her situation from all angles. I also really enjoyed the setting. Before Tied to Deceit, I hadn’t read many works exploring India. A glossary is included at the end of the book to help readers with unfamiliar terms. Tied to Deceit is a nice change of pace from the faster thrillers and mysteries I see everywhere nowadays. The slower storyline is still just as engaging, but allows the readers to fully immerse themselves in the mystery and enviorment and fully appreciate the events of the novel. Skyler Boudreau is a book reviewer with Reader Views and Feathered Quill, a freelance writer, and a musician. She can be found on Twitter, Tumblr, Goodreads, and Instagram @SkylerBoudreau. One day she hopes to work as an editor and best-selling author, but for now she is pursuing a career in freelance writing. For book reviews or other business proposals, please see the form on the contact page. Follow Sky View Book Reviews on Facebook!